Published on 31 October, 2010 in Fedora and FOSS. 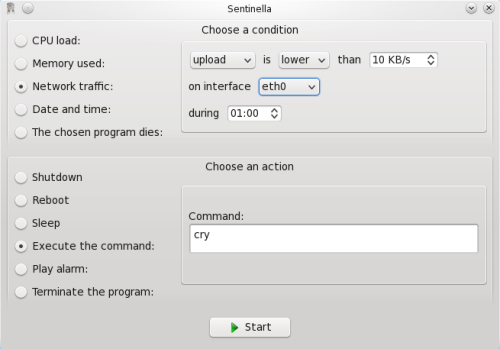 4 Comments Tags: kde, sentinella. Every now and then you come across a handy little application which, when thinking back, could have made your life so much easier at some point in the past. Sentinella is one of those – a program which will perform a task when something is triggered. It’s simple, there’s a condition (such as CPU load, memory used, date/time or network traffic) that when met will perform a function that you specify. This might be some hard-coded options like shutdown or reboot, terminate a program or simply sound an alarm, but it can also execute a program. That means that you can really make it do whatever you want! Once you start a job, Sentinella runs in the background and just pops up once a condition is met, before performing the specified task. So, you’re uploading something somewhere but need to get to work and can’t wait? No worries, just tell Sentinella that when rsync dies, turn off the machine. It’s packaged for Fedora, so just install and enjoy! I´ve been using it for a while and i can say that is my favorite. I use to leave the computer turned on during the night, and i don´t like to waste energy so, when i go to bed or i turn off the pc or i put sentinella to leave the computer on while is downloading something or the computer is busy with some rendering…. Thanks for the post. It really is a handy tool.. just brilliant. Also if you have any issue or feature request just tell me. No worries, thanks for your great app 🙂 It’s not a tool I have to use every day, but if I can think of any enhancements I’ll be sure to let you know!